The topic of ergonomics is becoming a significant talking point at workplace leadership meetings as it is an important concern for not only leaders but rank and file employees as well. The modification of products, processes, and systems with the goal to reduce human error, increase productivity, and enhance safety and comfort for employees are admirable objectives for any business. Not only are these objectives welcomed by employees, but with correct implementation, they will help a business flourish. And of the many ergonomic hazards found in a workplace, one in particular, is the ergonomically correct use of a fume hood. When signs or symptoms of MSD are noticed, they should be addressed immediately and amendments made. So what can be done to reduce your chance of MSD’s and make working at a fume hood much more friendly to your health? • Pull your chair up to the fume hood so that your back is supported by the backrest. Remove the chair arms if they interfere with your ability to get work done. • Work at elbow height and try not to raise your arms above shoulder height. • Avoid overreaching by placing materials close to you. • Avoid resting arms on sharp edges of the fume hood. • Take breaks to relieve pressure caused by leaning on the front edge of the fume hood. • Place disposal bins close by and at elbow height. • If possible, remove drawers and supplies from under the fume hood for extra leg room. When there is limited legroom, standing or partially seated postures will reduce forward bending or reaching, leading to less strain on your back and shoulders. • Make sure the viewing window is clean to reduce eye strain. • Support your feet on a foot ring or platform. • If you must stand at the fume hood, wear proper footwear with good cushioning or use anti-fatigue floor mats. No one wants to be injured and out of work and no one wants an MSD that could have been prevented, so take note, and implement these tips. When done right, you will have happier employees that are making fewer mistakes, showing signs of increased productivity, while being safer in the process. It takes time and effort, but better ergonomics leads to better business. 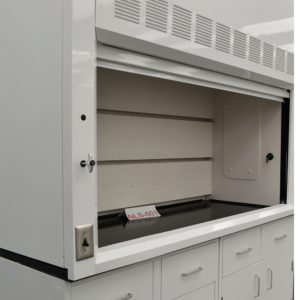 National Laboratory Sales is a full service new and used lab furniture supplier carrying a full line of fume hoods and cabinets. We are happy to help you with your laboratory needs and encourage good ergonomics in all workplace settings. 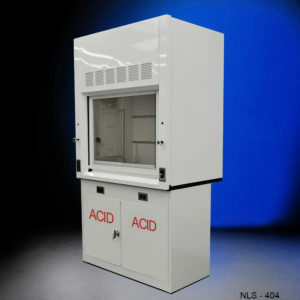 What Voltage Does a Fume Hood Require?